Well it's Saturday and time to take a look at who said what about this week's pic. Remember our lovely ladies? Mel B just never knew there'd be a Spice Girls reunion. But I didn't scare everyone off. 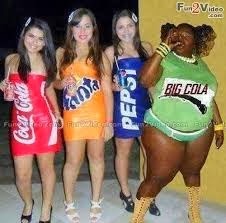 and former Biggest Loser contestant Lola the Big Cola. I've been known to take a Coca-Cola or Fanta to bed, and maybe even a Pepsi. But the last time I took a Big Cola to bed I was up all night. Well, good for you Shawn. I guess that box of Viagra came through for you, eh? Congratulations, though, you be hangin' with the dufus this week. 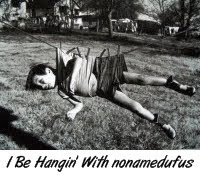 And I refuse to ask you "How's it hangin' eh?" I think we already have a good idea. Here's your badge you old smoothie you. Hey, make sure you join us next Wednesday for another edition of Pause Ponder and Pun. Like the lottery people keep telling me, "You gotta be in it to win it!" I'm so excited over the win Duf, that I think I will be up all night. Congratulations, Shawn, good job! I'll be back again next week, Dufus, I need that stinkin' badge! Gee, Shawn, they say you should call a doctor if it lasts more than 4 hours. Are you complaining or bragging? Congratulations on your big…win. Badges? You need some stinkin' badges?